American Sourced, Part 4: Does Imported Water Make Sense? There’s a giant misconception that imported bottled water is far superior to U.S.-sourced bottled water. Why is that? Imported water comes from places such as Fiji, Germany, Italy, and Norway. Why, though, does it make sense to bottle water and ship it around the world? Imported bottled water accounts for about $130 million in sales in the United States. That’s tens of millions of bottles that are put on container ships and sent across oceans so U.S. consumers can make the purchase and send their money back the country where the water originated. Consumers continue to do this because they’ve found that imported brands taste better than the filtered tap water found in America. The truth, though, is that consumers don’t have to look across any oceans to find one of the best-tasting bottled waters in the entire world. Water connoisseurs in the United States are starting to learn that supporting the import of artisan water just doesn’t make a lot of sense because there’s a better-tasting domestic water that is popular among pro athletes, celebrities, and health-conscious people across the country. Every year, Castle Rock Water competes in the Berkeley Springs International Water Tasting Competition. Bottled water companies from around the world compete for the title of Best Tasting Water in the World. 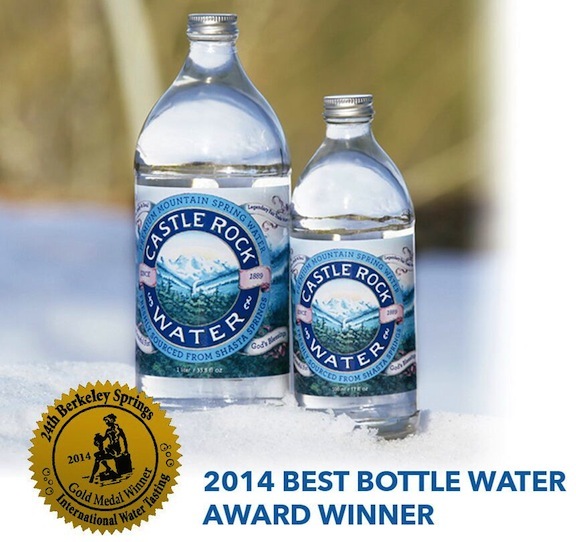 Castle Rock Water won the gold medal in 2014, silver in 2015, and was also named the best tasting sparkling water in all of North America last year. Why does Castle Rock Water taste so good? That’s a long story that begins at the top of Mt. Shasta where water collects in glaciers. Meltwater from the glaciers flows into cracks and ancient lave tubes in the mountain, where it spends the next 100-10,000 years slowly filtering through the mountain. Along its journey the water picks up vital nutrients and minerals. The water moves constantly during that time and never sits stagnant. When it finally exits the mountain in energetic streams, the water is charged with vitality and living structure. It’s also exceptionally clean and pure. Castle Rock Water has a gravity-fed bottling facility that collects this raw, pure water and bottles it in glass. It’s never touched by humans and never altered from its original form. The water you drink from Castle Rock Water’s glass bottles is the very same water that you’d drink from the pure streams on Mt. Shasta. With the best-tasting water in world right here in your own backyard, why look anywhere else?